I will try to give NuclearPhynance friends an idea about my new research on stochastic differential equations and their simulation. My formal research paper will be ready in a week but I will present some preview details about the research for the friends for discussion. Though many better techniques exist to simulate the stochastic differential equations for a finite step or to find their density, most of them lack generalization and have to be applied in special settings. We derive a generic new method that can simulate even non-linear stochastic differential equations to arbitrary accuracy. The method is extremely simple and is based on the simple understanding of how the non-linear coefficient functions are changing in time. I have tried to give some intuition about it in the exposition below. Since we want to proceed step by step, we will first calculate these integrals for a normal brownian motion as given in Eq (2) and after gaining intuition , we later generalize the SDE from Eq(2) to Eq(1) and calculate I(t) and S(t) with the most general dynamics as given by Eq(1). We start by calculating I(t) as given by Eq(4) and Eq(2). Now we come to the most important step towards understanding of this expansion. We expand the first noise term on RHS of Eq(7) by substituting Eq(8) in it. None of the above nested integrals vanishes and their continuations do not go to zero. I have devised schemes in my research that can calculate all different types of above integrals with arbitrary complexity of nesting to perfect precision using very simple integral calculus in a form that is a function of only time t, and a unit gaussian. We would similarly expand the second term of Eq(7) on RHS using Ito expansion of and substituting it in Eq(7) . We will freeze the coefficients of above expansion at time zero like we did to get Eq(10) and get different integrals like Eq(11-13). All these stochastic integrals can be trivially solved by scheme I have devised in my research. To be continued tomorrow. Sorry, tired of writing more at the moment. In the previous post, I mentioned a general technique of expanding stochastic integrals in a way that we can utilize higher derivatives(than the two derivatives of stochastic integrals as is the current best practice) in evaluation of stochastic integrals and in simulation . We can continue to take higher derivatives, and freeze the derivatives in the tail at their zero value and later evaluate the stochastic integrals composed merely of z(t) and t and expand them in powers of standard normal N(0,1) and a function of time and volatility. I will explain with some basic examples how nested integrals mentioned in the previous post can be trivially simulated with perfect accuracy to any length of time. The detailed evaluation methodology will follow in a later post. where N(0,1) indicates a single standard normal draw in simulation. The above simulation for the stochastic integral is valid for any length of time as is the case with simulation of all other nested integrals that I will mention. For example, the above simulation equation can be simply verified by most members of the forum by setting up a simulation in 5-10 minutes. Similarly taking Equation 12 in the first post, we have a stepping technique that remains perfectly accurate for all time horizons. C1, C2, C3 in the below are fixed constants. Most friends would have realized that in a complex simulation we can put together the coefficients of powers of standard Normal and simply multiply those coefficients with the N(0,1) powers and add to get the result. I am quickly pasting the code for one example integral zdz. Please copy it in your matlab editor or simply clone in any other language. As I have set up the simulation, you can trivially modify the simple monte carlo using equations I gave in previous post vs how we traditionally do an accurate short stepping monte carlo. Excuse any possible minor errors as I am not being formal. Your feedback is requested. Here is the main function. 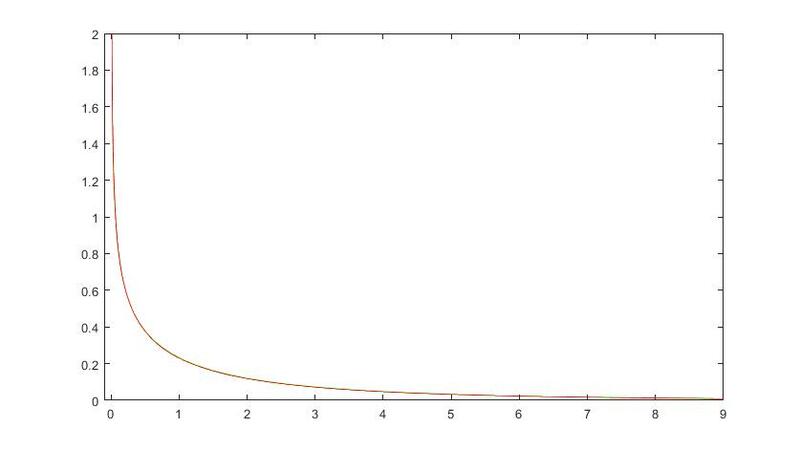 I2(1:paths)=0.0;%integral zdz over time by traditional short stepped monte carlo. for nn=1:T_index %Loop over time. zzT=z0*sigma0.*Random1*T.^.5*2.5/sqrt(2*pi)+... %Excuse the coefficients 2.5/sqrt(2pi). It is unity. I followed as I wrote on internet. Please modify. MaxCutOff=1000;%Max cut off is a value given to density generation program. %Processes monte carlo paths to return a series Xdensity as a function of IndexOut. IndexMax is the maximum value of index. For the interest of NP friends I will post slightly modified version of the previous program that computes the integral of tzdz or t(z-z0)dz by putting z0=0. If my one step method has a different shape, it is more accurate than the shape of density from very short stepping method. You can look at mean and second moment numbers that they match very well. You will need the helper matlab function from previous post to plot the density. I will be posting a full fledged simulation of CEV model option pricing program in 2-4 days. 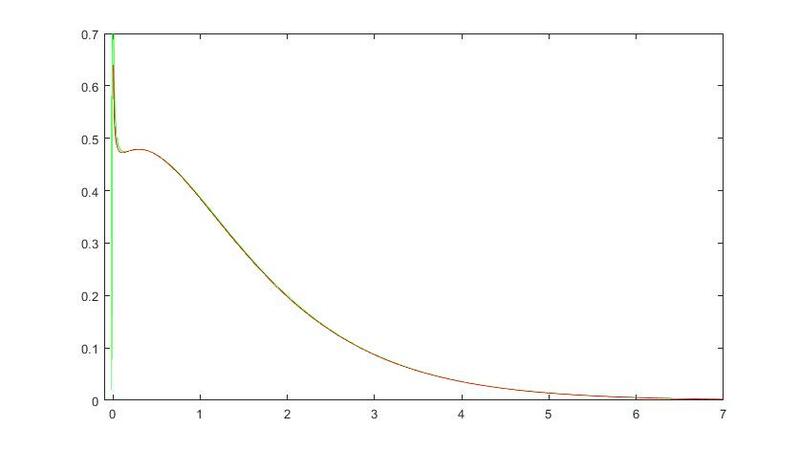 I2(1:paths)=0.0;%integral tzdz over time by traditional short stepped monte carlo. Though I just gave a detailed scheme for a double nested dz integral, many intelligent and smart mathematicians would have guessed that a doubly nested dz integral can be described in terms of hermite polynomials of degree up to 2 and similarly the integrals with nesting degree 3 could be described in terms of hermite polynomials of degree three and less and so on for higher degree of nesting. Of course, you have to make adjustments due to volatility and time multipliers that affect the total variance. For a reference to above formulas with nested dz-integrals when you have calculated the appropriate variance, you can calculate them by a slight modification after following the reference below. "Brownian Motion and Stochastic Calculus" by Karatzas and Shreve. You have to follow the Exercise 3.31 on page 167. Most friends would realize that we can do a much high order monte carlo than existing practices. Most of the integrals involve simple and basic arithmetic with a minor application of integral calculus. If you take high enough order in expansion of drift and volatility part of SDE, you could do a 5yr monte carlo with desired accuracy in just one step. In the context of my first post, this technique has never been applied to monte carlo before. My upcoming paper also has a portion devoted to very interesting applications of Girsanov theorem to non-linear SDEs with drift. I will also try to write a C++ code for NP friends because that is what I will do myself finally. A word of caution, Karatzas and Shreve reference I mentioned will have to be slightly modified but you could see that different nested integrals in our case remain orthogonal to each other which is probably the only requirement for a general application. For the friends who would like to know how the further nested integrals can be calculated here is a small program for third order nesting integral. I2(1:paths)=0.0;%integral zdz0 over time by traditional short stepped monte carlo. I will take a few more days to complete the paper but here are a few formulas for friends. here n, which is the order of hermite polynomials, equals the number of normal uncertainties. Fourth order and higher integrals can be evaluated to perfect precision using this method so I am not giving examples for that. We take a general stochastic differential equation. Guys, very sorry. But you have to follow the missing discussion on W****tt. I feel truly bad mentioning W****tt here but due to so many different thing happening, I could not keep up with posting here regularly. My apologies. Here I restart the discussion. The method can be applied to ODEs as well. Though I think most intelligent friends would already have realized how my expansion of variable coefficients into iterated integrals with constant integrands in the case of SDEs as I have shown in the previous discussion applies to ODEs, I will still like to give a general example. where a(X) and b(X) are totally general variable coefficients. In order to make exposition more clear, we emphasize the implicit dependence of X on t. X depends on t but not necessarily explicitly and a(X) and b(X) are coefficients that depend explicitly on X but would usually have dependence on t only through implicit dependence of X on t.
We start at time t=t0 and want to find the value of X at a t=t1. Similarly, we can expand again to find. We have to realize that the higher order terms(>3 in the above equation) continue and their addition will continue to add more accuracy. Many mathematicians would have realized that dt integral terms when considered alone without constant coefficients converge to exponential of dt. But we have now constant weights on each term of the Taylor expansion of the exponential and this expansion with constant weights gets equated with the solution of ODEs with variable coefficients. Please note that this method can be used for other kind of ODES like 2nd order with variable coefficients and many other ODEs and so on. You could probably use it for many PDEs as well. You have to be ingenious. Is it(for ODEs) not exactly the same methodology and same series of steps what we have been doing for SDEs previously. Intelligent friends would know that the above most general ODE in Eq(A) can very easily be solved by the above method of iterated integrals that I proposed. The general ODE solution expansion just would not have constant integrands as we see for the simplest type for which I did the solution exercise. In the solution of most general ODE as in Eq(A), the iterated integrals solution would possibly keep some terms in t that would have to be integrated in t.
Please check this attached program for simulation of CEV noise using SCSD technology. In case you cannot download it. Here is the code. X0_max=800;%Total number of SD Fractions. X0_mid=400.5;%Mid of the SD Grid. Lies at z0 by definition. dX0=.0125;%*8.0;%Width of SD cells in terms of Standard Deviations. prob=exp(-.5*((iivector-X0_mid). *dX0).^2)./sqrt(22/7.0*2.0)/(sqrt(t)*epsilon); %Probability in each SD Grid cell. %If it is made of straight line increments, decrease the bin size. Here are some quick notes about the previous program. The diffusion I am analytically simulating is dX=epsilon X^gamma dz(t). The results are very encouraging. However the accuracy sharply deteriorates when significant mass of the diffusion gets absorbed in zero. If diffusion reaches zero but significant mass does not get absorbed in zero, the results are still very good. The reason is that we have divided the total density into standard deviation fractions. The most negative standard deviations expand the fastest in negative direction and the most positive standard deviation expand fastest in the positive direction at a rate proportional to standard deviation count and so on for intermediate values. When significant mass is absorbed at zero, a large fraction of the negative standard deviations is absorbed in zero but remaining more positive standard deviation fractions continue to advance. By contrast, when we simulate by monte carlo, the mass that is away from zero contains all standard deviations and hence a method that mimicks Gaussian must contain all standard deviations. Our analytic method works by advancing all standard deviations independently. When significant standard deviation fractions are absorbed at zero, we must re-assign standard deviation fractions to all the probability mass that has not reached zero so that it contains all standard deviation fractions. This is however not very simple or straightforward to do and would require an algorithmic effort to do it. Another way to approach the problem would be to reflect the negative standard deviation fractions that reach zero back into positive domain with negative amplitude that cancels the increased amplitude due to lack of negative standard deviation. This will also require some effort and I have not worked on it. Close vicinity of zero is not a problem for the algorithm when significant mass is not absorbed. The only problem is that negative standard deviation fractions that get absorbed in zero are lacked in the positive body/domain of the noise diffusion where all standard deviation fractions must be present for a perfectly Gaussian algorithm. Some way around it can be worked out with a bit of effort. After a few years (>1-4)the accuracy starts to decrease. Here I will like to mention that my estimate of mean is only based on a rough summation so you will have to write your own integration routine on subdivisions each with different width. Here I would like to remind readers of my density correction technique that changes the density so as to make its mean equal to a given number while keeping the mass equal to unity. I presented it in an old program in which I calculated transition densities with Girsanov. I will find that out again and explain it here in a day or two. That routine can be very handy for removing small biases in the density in a way that density moves in the desired direction and its mass remains unity and average over the density becomes equal to the desired average. With the help of that small density correction routine, you can freely use the above method even where large accuracy is required for the CEV noises where significant mass is not absorbed at zero for short to medium time horizons. I will explain that routine here probably in my next post. I have written about some of the ideas about what we can do with this new technology using equations here on my google drive. You can download the three page pdf document using the link. In light of my post on this thread dated 2016-05-02 18:31 and another post dated: 2016-04-30 15:23, I want to mention that I had fully specified the method of iterated integrals solution to SDEs as early as May 2016. Though I have written a formal paper on iterated integrals solution to ODEs, I have not written a formal paper on iterated integrals solution to SDEs. If any friend wants to do further research and discover new things using method of iterated integrals beyond what I have done or include method of iterated integrals in a book, I would request them to please give reference to my research that I deserve. I would be very thankful to friends who would give me credit that I deserve due to my original research. The title is: Method of Iterated Integrals for Solution of Stochastic Integrals with Applications to Monte Carlo Simulation of Stochastic Differential Equations. In this article we suggest a new method for solutions of stochastic integrals where the dynamics of the variables in integrand are given by some stochastic differential equation. We also propose numerical simulation of stochastic differential equations which is based on iterated integrals method employing Ito change of variable expansion of the drift and volatility function of the SDE. We repeatedly apply the Ito change of variable formula or Ito product rule to integrand and find its higher order derivatives and later we find the contribution from these higher order derivatives to the integrand using higher order iterated integrals. First order derivatives of the integrand, for example, would employ second order iterated integrals to find their contribution to the solution. We evaluate these iterated integrals terms at the initial time of the simulation along with the solution of the stochastic integrals which is found in terms of Hermite polynomials and variance of the integrals. We apply the method of iterated integrals to simulation of various stochastic differential equations. We find that the accuracy of simulation sharply increases using the method of iterated integral as compared to naïve and simple monte carlo simulation methods. Sorry, I made minor changes to paper. The legends for some graphs were bad and one graph was misplaced and I had to change that. I want to ask friends what is the right reference for section 3 of my paper. When I did it, I followed a problem in "Brownian motion and stochastic calculus" in exercises where the solution was given. I took cue from it, played slightly around and came up with the formula in section 3. But I am sure the precise problem must have been solved decades ago. Can somebody point me to appropriate reference and I will add it to my paper. Ok, this is an older post for a related reference. Can somebody point to appropriate reference. In this article we suggest a new method for solutions of stochastic integrals where the dynamics of the variables in integrand are given by some stochastic differential equation. We also propose numerical simulation of stochastic differential equations which is based on iterated integrals method employing Ito change of variable expansion of the drift and volatility function of the SDE. Method of iterated integrals is a method of solution of integrals in which we repeatedly expand different terms in the integral as an initial value and an integrated derivative so that their sum would equal the original term in the integrand that was expanded. We continue to repeatedly expand the integrals until we have enough accuracy in the terms evaluated at initial values so as to be able to neglect the highest derivative term. We evaluate all these iterated integrals terms at the initial time of the simulation along with the solution of the stochastic integrals which is found in terms of Hermite polynomials and variance of the integrals. We apply the method of iterated integrals to simulation of various stochastic differential equations. We find that the accuracy of simulation sharply increases using the method of iterated integral as compared to naïve and simple monte carlo simulation methods. I am giving mathematica with which you can now solve any SDE or their stochastic integrals to arbitrary order. I will follow soon with examples and graphs. Restriction is that you cannot have an explicit t or its powers in the SDE and it can solve the most of the SDEs of the type that usually appear in math finance usually with only dt. If you want a program that also calculates the solution with explicit t in drift or volatility, you have to contact me or change this program. I have posted explanation of code on W****tt technical forum. Sorry, I had earlier promised to post a matlab program for calculation of solution of distribution of SDEs and their stochastic integrals. I wrote the program a few days ago with monte carlo and it works well on many SDEs but has problems when I apply it to some other SDEs. One reason I think is that instead of integrating over normal distribution, I started by using randomly drawn normal numbers. And with larger times and higher order of hermrite polynomials, I continued to see problems due to bad higher order distributional properties of pseudo random numbers. If somebody wishes, I would be willing to share my program with monte carlo. I would be writing and testing another matlab program to integrate the hermite polynomials with normal density and hopefully share it after the weekend. Sometimes I think that such a method should probably be called hermite transform method to solve the SDEs because I think that they are in some sense analogous to what sine and cosine with different frequencies are to fourier transforms and I am sure some of the similar problems might arise when we integrate higher order hermite polynomials just like the sort of problems arise when high frequencies are integrated in fourier transforms. We can of course know that hermite polynomials are orthogonal basis functions just like sines and cosines with different frequencies are basis functions for fourier transforms. An obvious difference is that high frequencies in fourier are mostly seen in short term options. But comparing with fourier transforms, we see that as fourier with zero frequency gives us the mean, here hermite polynomial of order zero gives us the mean. It seems that many times it could possibly be more important to get lower order hermite polynomials right as compared to adding larger order hermite polynomials. May be we can take series in hermite polynomials upto possibly eighth order and take larger number of terms so that coefficient terms with each of these low order hermite polynomials converge. Taking the extreme case, we can see if series of terms with hermite polynomial of order zero does not coverge we will never have a right distribution since mean will be off even if we have included the 32nd order hermite polynomials in the expansion. But this would have to be very carefully seen and properly researched. But we can probably do a rough analysis of convergence once we know how and when the time coefficients that arise from the integration and calculation of variance converge and when factorial takes over the higher order powers of terminal time and based on that and combined with already calculated coefficients of hermite polynomials a simple analysis of convergence could be possible. Though lack of convergence in coefficient terms of higher order hermite polynomials would be a problem but lack of convergence in the series of terms which are coefficients of lower order hermite polynomials would be a far larger problem. With the current expansion, I do not believe that it would be possible to solve all the SDEs universally with something like hermite polynomials to 16th order which could possibly work only till a year in some of my simulations. Really it could be a possibility to use higher order hermite polynomials only if we use a carefully chosen numerical discretization scheme instead of doing monte carlo simulations. Ok, I have really not thought about it carefully but can we somehow calculate delta and gamma using this method as a possible byproduct of the solution technique? I will try to think about it later but any thoughts from friends? I also plan to work on some simple algorithm to add term structure of volatilities to existing method. I have worked with a new Ito-Taylor tree method for calculation of densities of SDEs and their path integrals. In this method, we start an Ito-Taylor tree for the SDE from origin. Each branch of Ito-Taylor tree is like an ODE for a particular value of the standard normal variable. And we re-compute the Ito-Taylor coefficients given the new initial values of X for every branch along the Ito-Taylor tree for every time grid. We have to account for variances.Basically Ito-Taylor tree method is just converting an SDE evolution into ODE-like evolution where each ODE evolves with the particular value of normal assigned to the specific branch of Ito-Taylor tree. The method is lightning fast since the tree branches once at origin and never branches after that. I have taken only 81 branches and there are only 64 time steps per year and one step computational effort for every branch is roughly comparable to monte carlo simulation computational effort for one single path. So you can yourself imagine how super-fast the method is. Its speed is roughly comparable to monte carlo with only 81 paths. I will soon be writing a formal research paper about this method. We analytically compute the hermite polynomials weights for a particular SDE in terms of initial value parameter i.e starting value of the SDE variable, X0. I have lumped together all time calculations related to variances and drifts into calculation of hermite polynomial weights and later, in the evolution of Ito-tree, I solely use variances of standard normal random variable without any further consideration of variance or drift dependent time values. Please note that analytical solution(from Schroeder's formula/its time changed version) given in the program can be compared with Ito-Taylor solution only when beta=1 in the program. I have taken a very small step and used 64 time intervals per year. Green line in graph is Ito-Taylor solution and red line is analytical solution. Sometimes, when parameters of SDE are extreme, you might want a Ito-Taylor tree with first four hermite polynomials and you could then also take a larger step. Larger step might not have much of an advantage since we are working with a hundred or so paths. Almost the density of any SDE can be found by this method. I have written the following program for CEV-like diffusion and lognormal-like drift because it can be analytically evaluated with Schroeder's formula. But you can find the density of almost any SDE with mean-reversion and so many other features. You could also calculate the densities of path integrals of these stochastic volatility SDEs and plug those values in lognormal or CEV formula. Here is the matlab program. Please note that program execution speed involves the calculation of analytic density and I did not work on optimizing that. I have taken like 2000 integration steps while anybody could easily do it with only 200 steps. Here is an output of the matlab program from previous post. Here X0=1, mu0=.15, sigma0=.65, gamma=.6 and T=2.0, I have used just two hermite polynomials with 64 steps per year. Green line is Ito-Taylor density and red line is analytical density. I have rescaled the graph to show the density area. And I have used just two hermite polynomials. I have also discussed the method in more detail at W****tt.com from post 703 to post 712. You can view that discussion here. Though I hope there will be interesting uses of the new Ito-Taylor tree method I mentioned in the previous post, some new possibilities also open up with this method. For example, in SDEs literature, it is almost always assumed that noise scales as square root of time as in Brownian motion. Though this might be intelligent in most of the situations, there is nothing there to say that this must always be the case. In many SDEs modelling physical phenomenon, noise might as well scale as .25 power of time interval or possibly .75 power of time interval and we can very easily solve those SDEs with different time scaling with this new method. Time scaling must not necessarily be related to Brownian motion and when it is actually not, we can use the new method to solve other SDEs that arise with different time scaling in the random noise. I am sure many smart finance professionals would like to use this method with time scaling different from squre-root of t.
Here I made a post on linkedin about this new method. I have also mentioned nuclearphynance.com there. Here is the link to post. Here I copy the post. Converting An SDE into Autonomous ODEs: The Ito-Taylor Tree Method for Solution of SDEs. In my new research on the solution of SDEs and their stochastic integrals, I have worked with a new Ito-Taylor tree method for calculation of densities of SDEs and their path integrals. In this method, we start an Ito-Taylor tree for the SDE with a few branches and each branch is associated with a certain value of standard normal random variable and the tree branches just once at origin/starting value of SDE . Each branch of Ito-Taylor tree is like an ODE for a particular value of the standard normal variable and each branch of the tree evolves in time autonomously and never re-branches save once at origin. And we re-compute the Ito-Taylor coefficients given the new initial values of X for every branch along the Ito-Taylor tree for every time level. Basically, Ito-Taylor tree method is just converting an SDE evolution into ODE-like evolution where each ODE evolves autonomously with the particular value of normal assigned to the specific branch of Ito-Taylor tree. The method is lightning fast since the tree branches once at origin and never branches after that. In the accompanying matlab program, I have taken only 81 branches that span a standard normal between -4 and +4 with a normal gird spacing of .1 and there are only 64 time steps per year and one step computational effort for every branch is roughly comparable to monte carlo simulation computational effort for one single path. So you can yourself imagine how super-fast the method is. Its speed is roughly comparable to monte carlo with only 81 paths. Sometimes, when parameters of SDE are extreme, you might want an Ito-Taylor tree with first four hermite polynomials instead of just two that I used in the program and you could then also take a larger step. Larger step might not have much of an advantage since we are working with only a hundred or so paths. And sometimes, when stability issues arise, you could use the method with just one polynomial. Here is a graphical comparison of the density from a simple matlab program and the analytical density. Here X0=1, mu0=.15, sigma0=.65, gamma=.6 and T=2.0, I have used just two hermite polynomials with 64 steps per year. Green line is Ito-Taylor density and red line is analytical density. On the link below, you can view the graph comparison. Here is another comparison of Ito-Taylor tree density and density from analytical formula. Here X0=1, mu0=.15, sigma0=.65, gamma=.8 and T=5.0, I have rescaled the graph to show the density area. And I have used just two hermite polynomials. You can view the graph comparison on link below.